U.S. Secretary of State John Kerry says efforts to find a political solution to the Syrian crisis will create a transitional government without President Bashar al-Assad.Kerry spoke Thursday in Rome, where he was meeting with Jordanian Foreign Minister Nasser Judeh, saying the goal is a transitional body agreed to by the Syrian government and those opposed to Assad. Kerry says that “clearly means” the Syrian president will not be part of the transitional government. Since the Bible suggests that Syria will support the coming final King of the South (Daniel 11:40-43; Ezekiel 30:1-8), I have been writing for some time that a change in or from the Assad regime will be necessary for this to happen–and it will come to pass. Syria’s Assad will not keep Syria as he has forever. Syria’s Assad has said that he will not step down and/or leave (unless voted out) in the past, so he will either change his mind, be voted out, or die. Between USA statements and the recent Israeli bombings of his country (Syria threatens Israel with ‘all options;’ Israel bolsters defenses; Russia and China express concerns), he must be feeling a lot of pressure. 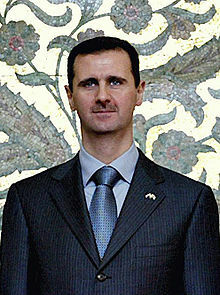 President Assad also must realize that he is not indispensable to Russia, so that is likely also on his mind. Thus, he may decide that he should get closer to Iran and fight against Israel to hope to hold on to power. If so, he will not do well, and ultimately likely neither will Damascus (which at some point is prophesied to be destroyed per Isaiah 17:1). This does not mean that the USA and/or Israel will get off unscathed. Syria and Iran can, and very well may, cause major damage to Israel and/or the USA, but as they are not prophesied to takeover the USA or Israel, they will not do so. This entry was posted on Thursday, May 9th, 2013 at 6:30 am	and is filed under Prophecy.